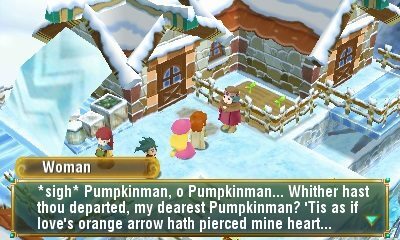 The second review of this series of three reviews in this Nintendo 3DS-focused month is Return to PopoloCrois: A Story of Seasons Fairytale. This is only the second PopoloCrois game in the series to reach the Americas and Europe. How is it? Let's start dungeon-crawling and farming to find out! The PopoloCrois franchise has been around in Japan for some time now. 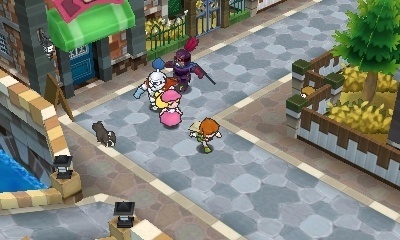 The West saw its first run-in with the franchise, that spans much more than just games, starting with a manga series, on the PSP. 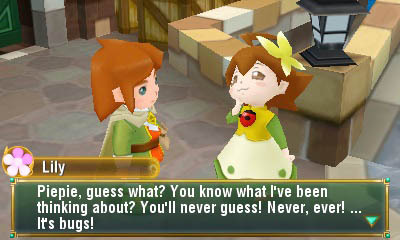 Now, the PopoloCrois series gets entangled with the Story of Seasons series. Combining a fair bit of dungeon-crawling with the farming simulation fun of the Story of Seasons and Harvest Moon brands, Return to PopoloCrois: A Story of Seasons Fairytale delivers an engaging story with pleasing characters and dialogue and accessible gameplay to all. You play as Prince Pietro, a son of the PopoloCrois royal family, who has multiple adventures and savings of the kingdom under his belt. 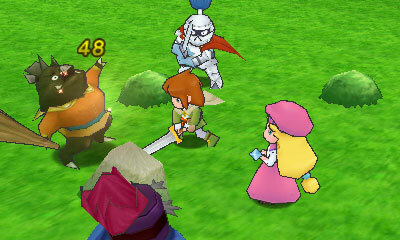 The game begins with a prologue, taking place in PopoloCrois, having players become accustomed to controlling Pietro and meeting with the locals. After a birthday celebration for Pietro, an evil sorceress covers the kingdom into the blackness, sending Pietro away to a foreign land known as Galariland. In order to "return to PopoloCrois", Pietro must remove the dreaded Black Beasts from the land that are causing the once rich farming soil of the land to be as useful as a screen door on a submarine, and return to his homeland to rescue it from the darkness that has engulfed it. Don't take too many of the sights in, Pietro and co. There are two lands to save! 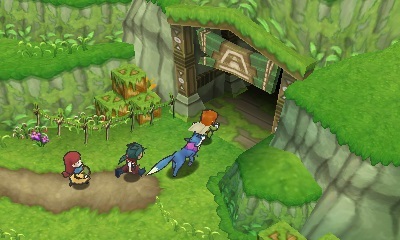 Battles take place in flat areas with turn-based combat. Characters move along a grid, and as your heroes level up, not only do they grow in strength and learn new abilities, but they can also expand their movement reach in battle. Positioning your party members strategically is the best way to deal with battles. For instance, attacking upfront has a higher probability of missing said attack as well as doing less damage than performing an attack from the rear, which generally results in a critical hit. That said, strategy also comes from predicting the location enemies will move to, as it's quite easy to go too gung ho and end up surrounded, taking lots of HP loss in the process. With rocks and other obstacles in the way, moving your characters smartly can be the difference between total victory and utter defeat. Attacking from a foe's front is brave, but it won't deal the most damage. Depending on the makeup of your party, you can perform pair attacks. This has two party members combining their forces to unleash a mega move on the enemy. The party member that initiates the attack is the one whose MP is used. 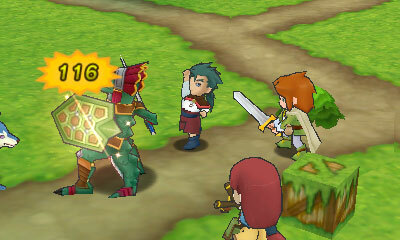 In addition to powerful pair attacks, characters have their own abilities and spells they can use which also cost MP. These can range from elemental spells that target a specific set of spaces on the battlefield to moves that restore HP to one or all party members. Meanwhile, attacking from the side or from an enemy's flank will deal more damage. The difficulty in Return to PopoloCrois is breezy at worst and a tad challenging at best. You have the option of changing the difficulty of the game in the options menu. On the normal difficulty I was able to just use the Auto battle command to have my party members be controlled by the AI for most of the game. This sped up the play time by not having to go through the slow and tedious process of maneuvering party members across the battlefield when the enemies I was facing were total scrubs. As the game neared the end, I found myself enjoying the battles more by the harder enemies and having to manually fight them myself. Thankfully, even with battles against weaker foes, the ability to lower or raise the amount of random encounters at any time was a blessing. Want to grind to level up your party? Then, raise the random encounters to High. Want to rush through an area with less of a threat of random encounters? Then, put the random encounters on Low. In the beginning chapters of Return to PopoloCrois, you'll want to put the random encounters on low, as there is a good amount of backtracking and moving through areas full of weak enemies. It's not until a couple of chapters in that Pietro receives the ultra helpful ability of fast travel, allowing him and his party to move instantly to most notable locations such as towns and farms under Pietro's control. This fast travel ability allows for an easier time and go of it for visiting potential love interests, taking on NPC quests, and returning to the various unlocked farms to grow crops and raise cattle. If you thought Story of Seasons's farming was a bit convoluted and time-consuming, full of micromanaging all aspects of the farm, then you'll find Return to PopoloCrois's farming a welcomed breath of fresh air. Farming is a simple as tending to the soil, putting a seed in the ground, watering it, and then returning to the scene to harvest it. Some seeds require a second round of watering, but you need not worry about forgetting, as the game smartly gives you notifications at the exact moment your crops are ready for the next step towards harvesting. It seems the farming life has been very good to Pietro. May I taste a strawberry? Alongside traditional farming, at your main base of operations, you can use the synthesizer to fuse together materials to make new items. While you're adventuring through Galariland, you can also mine for crystals and other materials, catch bugs, and gather even more resources for your farming and synthesizing needs. These materials and farmed goodies can then be sold or even given as gifts to Pietro's potential suitors, of which there are five throughout Galariland. 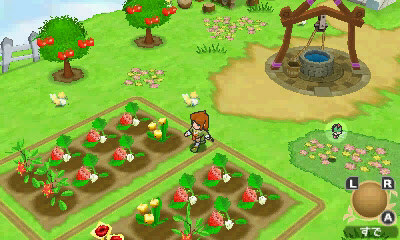 Though billed as a major part of Return to PopoloCrois, this being a Story of Seasons-related game and all, farmwork is all but necessary to enjoy the game. If you don't want to farm or harvest crops at all, you don't have to. While this is nice for those who have no interest in a farmer's life, knowing that such a heavily featured part of the game is pretty much just fluff is a bit disappointing. When you're not completing side quests or living life on one of the game's many farms, you'll be exploring dungeons. There are two types: field dungeons and regular dungeons. Field dungeons feature labyrinths full of narrow paths that are easy to get lost in. The problem here is that you have to go through so many field dungeons that have one of three different location themes that this process becomes tedious. The story-related dungeons don't fare much better, also filled with maze-like narrow pathways. The main temples of the game have the same background only with a different color, and also suffer from having the same boss each time. Fortunately, the areas and paths that connect the land of Galariland are much more interesting to explore. Journey to places both fantastical and more grounded in reality in Galariland. Return to PopoloCrois isn't a long game by RPG standards by any means. I beat it within 15-20 hours. However, after the final boss has been defeated, you enter an epilogue and the post-game content that features more farming gameplay, the ability to take on even more side quests, and a lot more. That said, Return to PopoloCrois doesn't overstay its welcome, and feels like the perfect length, at least to me. The dialogue is extremely well written throughout Return to PopoloCrois. The visuals of Return to PopoloCrois offer colorful worlds and detailed characters. You can opt to turn on or turn off a black border around each character. I chose to leave it on to give a more cartoony, extravagant look to the cast of characters. The game runs at a relatively steady frame-rate, and offers terrific stereoscopic 3D. The rare cutscene looks particularly great with the 3D effect of the Nintendo 3DS on. Voice work is done for most of the dialogue, though it's erratic what is and isn't fully voiced. There is a lot of cheesiness with the vocals, but it perfectly fits the game. I am particularly fond of Lord GamiGami, who has a hilarious chapter late in the game where he revisits a town he helped build under his image. Meanwhile, the music isn't standard RPG fare, having some atypical battle music for the most part. The music overall is pretty good, but it's nothing that extraordinary. Lily, it'd be great if you quit "bugging" ME. 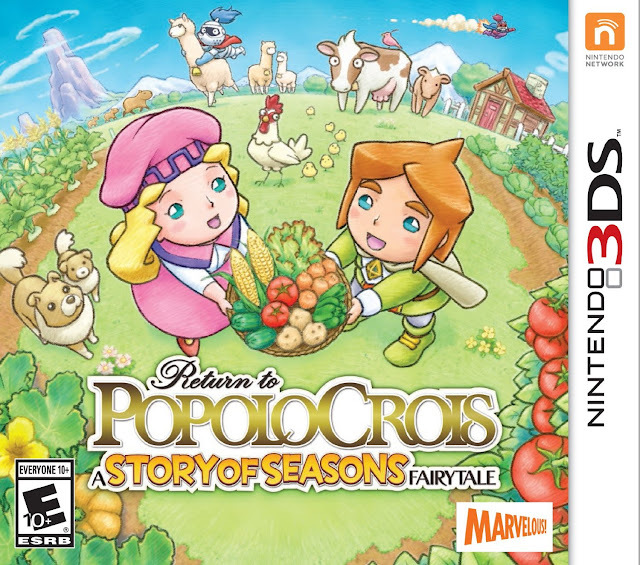 If you're looking for an endearing RPG with a low level of entry but enough gameplay goodness and charm to keep you hanging around long after the credits, Return to PopoloCrois: A Story of Seasons Fairytale is indeed a great game to grab. The story can be poignant and touching at times, a riot at others, and the customization options offer the ability to fine tune the game to your liking. Though the dungeon-crawling aspect of the game is a tad disappointing, overall, Return to PopoloCrois should have players harvesting a great deal of fun.